Soul Food Project presents St Patrick’s Supper! As part of Soul Food Project‘s programme of 2012 events, they’ll be celebrating all things Gaelic, with an evening of traditional Irish Cusine in the heart of Birmingham’s Irish district. 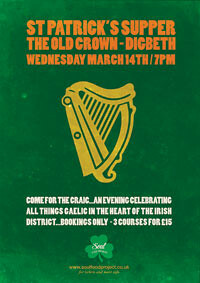 Come and join in the craic! Please note that this the evening is limited to 50 tickets – first come, first served!